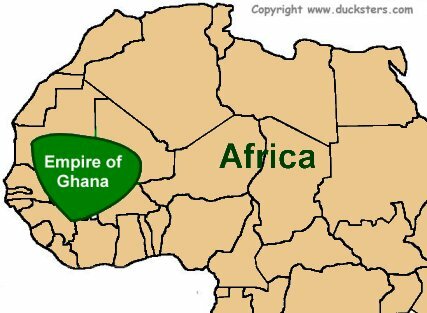 Where was the Empire of Ghana located? The Empire of Ghana was located in Western Africa in what is today the countries of Mauritania, Senegal, and Mali. The region lies just south of the Sahara Desert and is mostly savanna grasslands. Major rivers in the region such as the Gambia River, Senegal River, and the Niger River served as the means of transportation and trade. The capital city of Ancient Ghana was Koumbi Saleh. This is where the King of Ghana lived in his royal palace. Archeologists estimate that up to 20,000 people lived in and around the capital city. When did the Empire of Ghana rule? Ancient Ghana ruled from around 300 to 1100 CE. The empire first formed when a number of tribes of the Soninke peoples were united under their first king, Dinga Cisse. The government of the empire was a feudal government with local kings who paid tribute to the high king, but ruled their lands as they saw fit. Where did the name Ghana come from? "Ghana" was the word that the Soninke people used for their king. It meant "Warrior King." People living outside of the empire used this word when referring to the region. The Soninke people actually used a different word when referring to their empire. They called it "Wagadu." The main source of wealth for the Empire of Ghana was the mining of iron and gold. Iron was used to produce strong weapons and tools that made the empire strong. Gold was used to trade with other nations for needed resources like livestock, tools, and cloth. They established trade relations with the Muslims of Northern Africa and the Middle East. Long caravans of camels were used to transport goods across the Sahara Desert. Around 1050 CE, the Empire of Ghana began to come under pressure from the Muslims to the north to convert to Islam. The Kings of Ghana refused and soon came under constant attacks from Northern Africa. At the same time, a group of people called the Susu broke free of Ghana. Over the next few hundred years, Ghana weakened until it eventually became part of the Mali Empire. The Empire of Ancient Ghana is not related either geographically or culturally to the modern African country of Ghana. A lot of what we know about Ancient Ghana comes from the writings of Arab scholar Al-Bakri. Iron smiths were much revered in the Ghana society. They were considered powerful magicians because they worked with fire and earth to create iron. Crossing the Sahara Desert from a coastal city to Ghana typically took around 40 days when travelling on a caravan of camels. Most of the people living in the empire were farmers. They didn't own the land. Each family was allotted a portion of the land by the local village leader. Salt was considered very valuable and the salt trade was heavily taxed by the king. Much of the salt was mined in the Sahara Desert at the city of Taghaza where slaves were used to mine salt. Salt was sometimes used as money and was about as valuable as gold.